Smokin' Aces Events is stoked to have a fresh look to our website! We will continue to bring to you the highest quality events you have come to be accustomed to over the past 5 years of events! With a fresh looks comes with a simpler way to stay informed about our upcoming events, get registered for events and follow up on post event media and event reports. Smokin' Aces Events is proud to continue the Smokin' Aces Tour, but with the addition of several community based events we have to evolve with the times. The goal of Smokin' Aces Events over the next couple years is to expand the number of events we produce both at the local and regional levels. This is both on-slope as well as in your community. We look forward to seeing you at our next event! Make sure to stay tuned and up to date with all information coming out by follow us on our social media pages. Follows us on Facebook by clicking this this link, and follow us on Instagram by clicking on this link. March 31st, 2018 will go down in our memory as one of the rowdiest days on Blacktail Mountain Ski Area ever! The inaugural of the Flathead Monster Banked Slalom was one for the books!!! With over 65 skiers and snowboarders ranging in age from four years old to riders in their mid 60's, this event was truly one for everyone! With all of this support we were able to achieve our fundraising goals and raise $400 for the A-Rob Plant A Seed Project! This money will go towards helping give young boys and girls in the region the ability to hit the slopes and learn how to snowboard. This is such a humbling idea, we want to thank everyone for your support! We can't wait for Pam Robinson to get back from AK to give her the check! Congratulations to all skiers and snowboarders who came out to Schweitzer Mountain Resort for the 2018 Idaho Championship Slopestyle!!! We are stoked for all of the podium finishers and tip our hats to all the other competitors for putting it all out there! The 2018 Smokin' Aces Tour keeps things at Full Send as we near the 2018 Idaho Championship Slopestyle at Schweitzer Mountain Resort. Saturday, March 3rd skiers and snowboarders of all ages and skill levels will take their aim at the Stomping Grounds Terrain Park. We will be giving away over $3000 in Cash & Prizes! Entry fees are $35 for all age and women's divisions, and $40 for the open divisions. 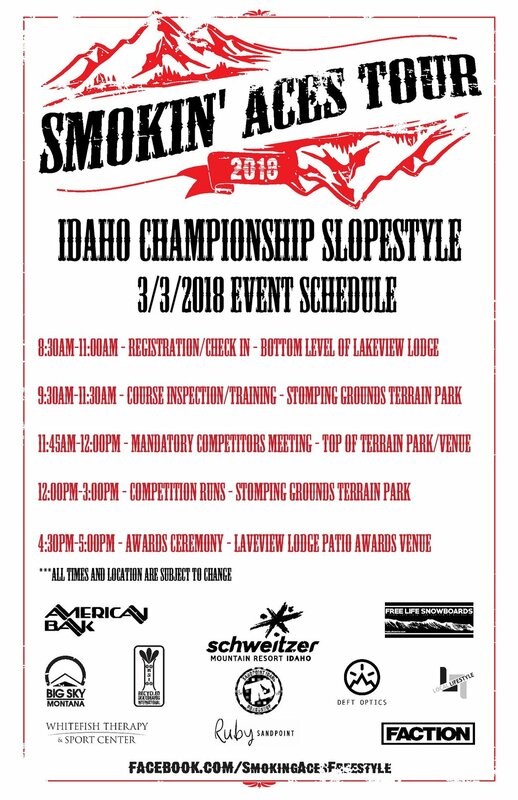 The 2018 Idaho Championship Slopestyle is the fourth event the Smokin' Aces Tour and Schweitzer Mountain Resort have collaborated on. With the snow gods playing their role this winter, this event is bound to be one for the books! Schweitzer Mountain Resort is have near record snow levels this winter. This gives the Stomping Grounds Terrain Park Crew so much more to work with then they have had in a while. This means their park is going to be big and dialed in!!! Don't worry, we will make sure to have a variety of jump sizes and options for all age and skill levels. This is a show that we can only wait to see. On Friday night, March 2nd, 7B Board Shop will be hosting a Pre-Registration Party at their shop. We will be downtown Sandpoint from 5pm-7pm to get competitors signed up and squared away for Saturday's event. 7B Board Shop will have discounts and sales for all competitors during the event. This is a great way to get signed up, so you do not have go through registration in the morning. Equating to, MORE SHREDDING! Come by 7B Board Shop in downtown Sandpoint to score some awesome gear at discounted prices and beat the morning crowds! Day of Registration and Competitor Check-In will take place Saturday morning on the bottom floor of the Lakeview Lodge in the Schweitzer Mountain Village. It will open at 8:30am and close at 11:00am. Competitors must get all paperwork signed and filled out before they can receive their event bib and enter the event venue on Saturday. All competitors under the age of 18 must have a waiver signed by a legal guardian to participate. Discounted tickets are available for competitors only. Junior (7-17) $36 // Adult $54. Schweitzer Mountain Resort has strictly requested for there to be no uphill foot traffic to this event. If you have any questions, please present them to Schweitzer Mountain Resort. 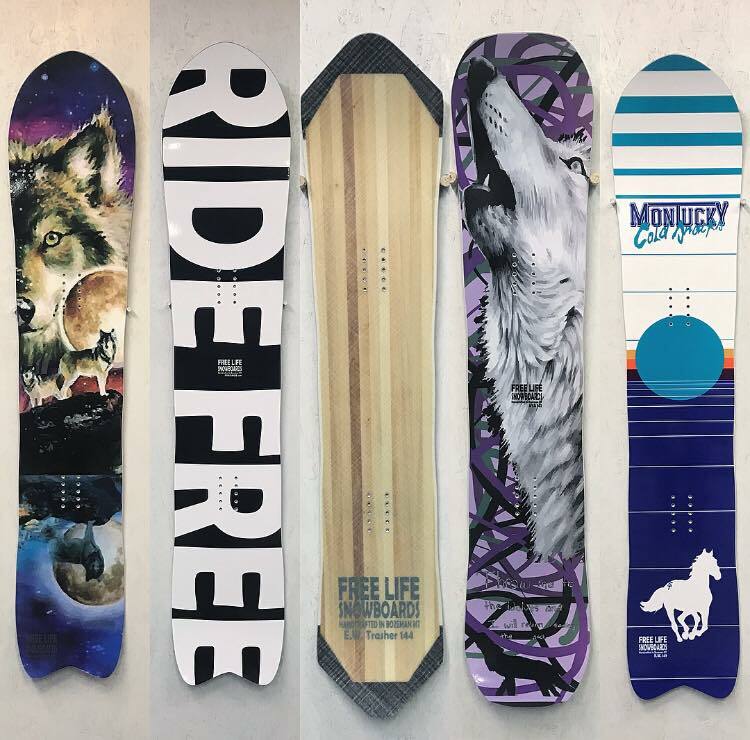 Free Life Snowboards will be on hand again showcasing their newest and raddest snowboards. They will have a tent set up at our awards venue on the deck of the Lakeview Lodge. Make sure to swing by them to learn all about what they are doing. Ever wanted to have your own custom pro model board? They can help make that a reality. We will also be giving a away one free custom snowboard from Free Life Snowboards to one lucky rider. You never know who it is going to go to...! Don't miss your chance to Ride Free!!! Bellow is a breakdown of the event schedule for the 2018 Idaho Championship Slopestyle at Schweitzer Mountain Resort. Please be sure to check back with the crew at registration for official times. Its 2018 and we are STOKED to bring back the Smokin' Aces Tour for another year of insane tricks and competition!!! 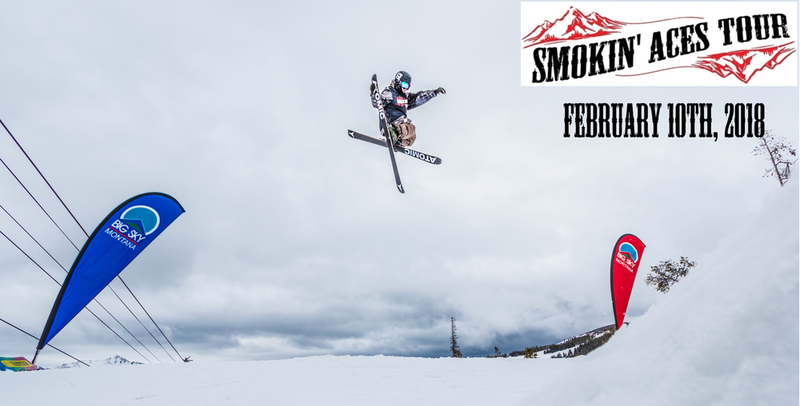 Big Sky Resort will play host to the 2018 Smokin’ Aces Tour: Montana Slopestyle Championship the weekend of February 10th in the Swifty Terrain Park. 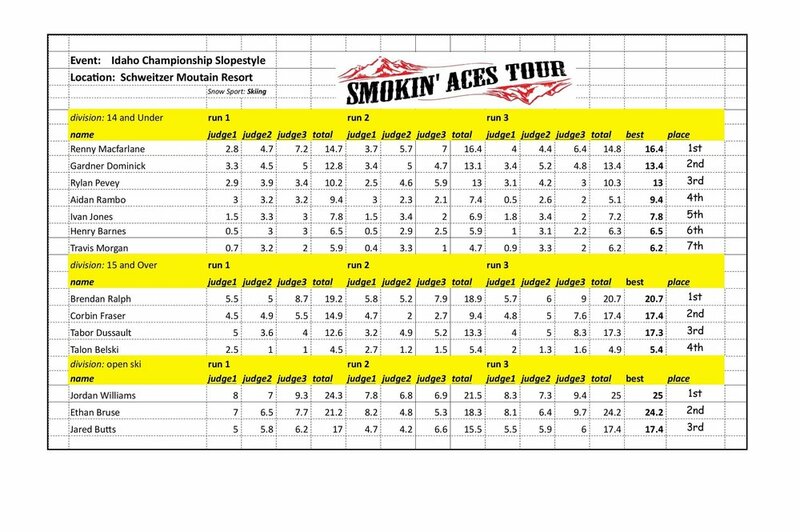 The Montana Championship Slopestyle is the first event in the 2018 Smokin' Aces Tour. Smokin’ Aces Events Director Billy Marcial expects more than 60 competitors at this year’s event. “We are very excited to be back at Big Sky Resort for the fifth consecutive year. In just a short period of time, the Smokin' Aces Tour stop at Big Sky Resort has become the largest freestyle skiing and snowboarding event in Montana.” says Marcial. According to Marcial support from major sponsors like American Bank of Montana has made the Smokin’ Aces Tour the highest attended freestyle competitions in the region. “The Smokin’ Aces events would not be possible if it was not for these sponsors and we are extremely thankful for their support.” Sponsors of the event include Great Northern Brewing, Free Life Snowboards, Whitefish Therapy & Sport Center, Haskill Base Layers, Local Lifestyle, The Board Room Big Sky, Recycled Skateboards International, Deft Optics, Faction Skis, Glacier World Photography, Schweitzer Mountain Resort and Big Sky Resort. The cost to enter the Montana Championship Slopestyle event is $40 for the Open Division and $35 for all other divisions. Discounted lift tickets are available to competitors at $49 for 11-17 year olds and $69 for competitors 18 and older. The competition will take place in the Swifty Terrain Park under the Swift Current Chairlift. Pre-registration is available online at www.smokingacestour.com/registration. There will be registration on the day of the event in the North Mammoth Room from 8:30-11:30am. Training will take place Saturday morning with the event scheduled to begin at 12:00pm. The table is set for the largest freestyle skiing and snowboarding event in Montana!!! We are equally as excited as you are! See you all February 10th @ Big Sky Resort!!! Please feel free to copy & print the attached waiver. All athletes must have one signed to compete. All athletes under the age of 18 must have one signed by a legal guardian.